Freddie Taylor's baptism service was drawing to a close on Sunday 9th July when one of the 83 strong congregation smelt fumes coming from the organ blower motor in the Vestry. Rev. Liz immediately initiated our evacuation procedure and within 3 minutes everyone was congregating on the village green for the remaining part of the service and then watching as 2 fire engines and other vehicles arrived to attend what was feared to be a potentially disastrous fire. 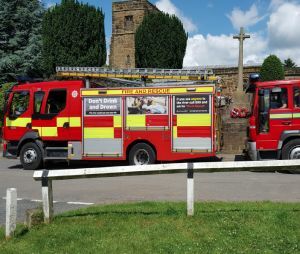 Fortunately, although very hot (130°C), the motor did not burst into flames and with the power off was allowed to cool under the watchful eyes of North Yorkshire's Fire Service to whom we are grateful for their very professional assistance. Thanks are also due to the baptism guest seated nearest the Vestry who quickly located the fuse box and deprived the motor of power. For the immediate future our friends at the Methodist Church have kindly loaned us their harmonium which was pressed into use at last Sunday's service by Ian Dysan, one of our regular organ players. The PCC will now be considering the options open to us for future musical support for services.